The other day I wrote about my dream involving the Hotel Morrissey, which naturally housed a Cafe Morrissey in its lobby. How this respite for weary travelers existed only in my dream no one can really know, but that was no excuse to not formulate marketing and product strategies! A Facebook post followed, and thanks to some truly ace ideas from a couple of friends, it cemented in my mind that this was perhaps the single greatest idea I had ever had! What follows are the fruits of our labors. Special thanks to Brian, Mario, Marc, Steve, Marya and Lauren for fueling the fire. 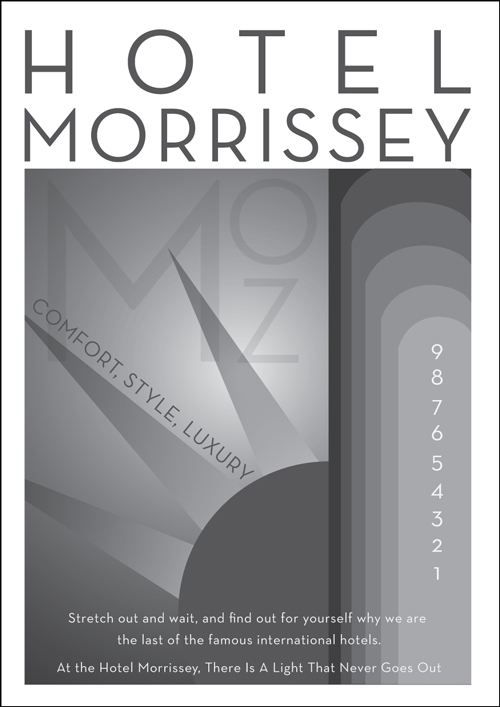 Please feel free to add your own ideas so that some day the Hotel Morrissey will become the reality it was meant to be. Morrissey is such the lyricist that this could go on forever (in which case I’m doomed). Need room service? Just dial a cliche, stretch out and wait, and find out for yourself why we are the last of the famous international hotels.